A just view of afflicting incidents is altogether necessary to a Christian deportment under them; and that view is to be obtained only by faith, not by sense; for it is the light of the world alone that represents them justly, discovering in them the work of God, and consequently, designs becoming the Divine perfections. When they are perceived by the eye of faith, and duly considered, we have a just view of afflicting incidents, fitted to quell the turbulent motions of corrupt affections under dismal outward appearances. It is under this view that Solomon, in the preceding part of this chapter, advances several paradoxes, which are surprising determinations in favor of certain things, that, to the eye of sense, looking gloomy and hideous, are therefore generally reputed previous and shocking. He pronounces the day of one's death to be better than the day of his birth; namely, the day of the death of one, who, having become the friend of God through faith, has led a life to the honor of God, and service of his generation, and in this way raised to himself the good and savvy name better than precious ointment. In like manner, he pronounces the house of mourning to be preferable to the house of feasting, sorrow to laughter, and a wise man's rebuke to a fool's song. As for that, even though the latter are indeed the more pleasant, yet the former are the more profitable. And observing with concern, how men are in hazard, not only from the world's frowns and ill-usage, oppression making a wise man mad, but also from its smiles and caresses, a gift destroying the heart. Therefore, since whatever way it goes there is danger, he pronounces the end of every worldly thing better than the beginning of it. And from the whole he justly infers, that it is better to be humble and patient than proud and impatient under afflicting dispensation; since, in the former case, we wisely submit to what is really best; in the latter, we fight against it. And he dissuades from being angry with our lot, because of the adversity found in it. He cautions against making odious comparisons of former and present times, in that point insinuating undue reflections on the providence of God: and, against that querulous and fretful disposition. He first prescribes a general remedy, namely, holy wisdom, as that which enables us to make the best of everything, and even gives life in killing circumstances; and then a particular remedy, consisting in a due application of that wisdom, towards taking a just view of the case: "Consider the work of God: for who can make that straight which He has made crooked?" In which words are proposed, 1. The remedy itself; 2. The suitableness of it. 1. The remedy itself is a wise eyeing of the hand of God in all we find to bear hard on us: "Consider the work of God," namely, in the crooked, rough, and disagreeable parts of your lot, the crosses you find in it. You see very well the cross itself. Yea, you turn it over and over in your mind and leisurely view it on all sides. You look to this and the other second cause of it, and so you are in a foam and a fret. But, would you be quieted and satisfied in the matter, lift up your eyes towards heaven, see the doing of God in it, the operation of His hand. Look at that, and consider it well; eye the first cause of the crook in your lot; behold how it is the work of God, His doing. 2. Such a view of the crook in our lot is very suitable to still improper risings of heart, and quiet us under them: "For who can make that straight which God has made crooked?" As to the crook in your lot, God has made it; and it must continue while He will have it so. Should you ply your utmost force to even it, or make it straight, your attempt will be vain: it will not change for all you can do. Only He who made it can mend it, or make it straight. This consideration, this view of the matter, is a proper means at once to silence and to satisfy men, and so bring them to a dutiful submission to their Maker and Governor, under the crook in their lot. PROPOSITION I. Whatsoever Crook there is in one's Lot, it is of God's making. I. As to the Crook itself. II. The Crook is of God's making. How it is of his making. Why he makes it. PROPOSITION II: What God sees meet to mar, we shall not be able to mend in our Lot. What Crook God makes in our Lot, we shall not be able to even. I. God's marring and making a Crook in one's Lot, as he sees meet. II. Men's attempting to mend or even the Crook in their Lot. III. In what sense it is to be understood, that we shall not be able to mend, or even the Crook in our Lot. IV. Some reasons of the point. Directions for rightly managing the application for removing the Crook in our Lot. PROPOSITION III: Considering the Crook in the Lot, as the work of God, is a proper means to bring one to behave rightly un der it. I. 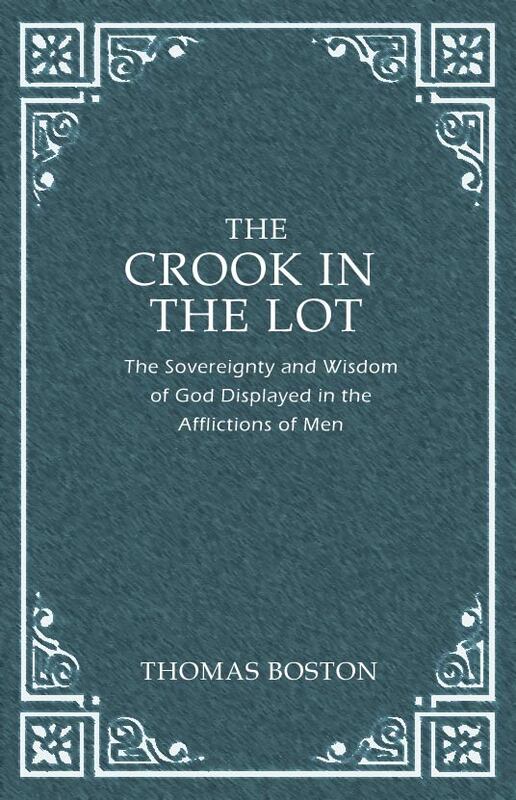 What it is to consider the Crook as the work of God. II. How it is to be understood to be a proper means to bring one to behave rightly under the Crook. III. That it is a proper means to bring one to behave rightly under it. A comparison between the Lowly and Proud. DocT. — There is a generation of lowly, afflicted ones, having their spirit lowered and brought down to their lot ; whose case, in that respect, is better than that of the proud getting their will, and carrying all to their mind. I. The generation of the lowly afflicted ones. II. The generation of the proud getting their will and carrying all to their mind. III. It is better to be in a low afflicted condition, with the spirit humble and brought down to the lot, than to be of a proud and high spirit, getting the lot brought up to it, and matters go according to one's mind. Humility the great means to bring all to their respective duties. Doctrine. I. The bent of one's heart, in humbling circumstances, should be towards a suitable humbling of the spirit, as under God's mighty hand placing us in them. II. What are those humbling circumstances the mighty hand of God brings men into. III. What it is in humbling circumstances, to humble ourselves under the mighty hand of God. Doctrine. II. In due time, those that humble themselves under the mighty hand of God will certainly be lifted up.